I do not know anyone who doesn’t love Dr. Seuss! Not even a Moose, or even a Goose! 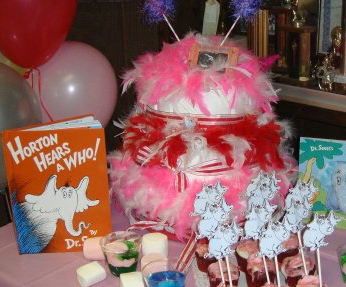 Here are some ideas for an unforgettable Dr Seuss baby shower theme. Baby showers are to celebrate the new baby and mom but they should be fun and entertaining for your guests too. When the new mommy arrives, crown her with her very own red and white “Cat in the Hat” tall hat. It will make her easy to spot in the crowd. I recommend focusing on one Dr Seuss book for the main color scheme. The Cat in the Hat and One fish, Two Fish, Red Fish, and Blue Fish are great because of the basic color schemes of red, white and blue. A Diaper Cake always gets the attention when guests are meandering and visiting before the party starts. Follow the Cat in the Hat theme by making the diaper cake look like his hat. It is very easy to decorate with red and white ribbons. Top it off with stuffed characters and other baby items. Print out pictures of Seuss characters and hot glue them to a coffee stirrer or bamboo skewer. Use these in centerpieces and insert them in cupcakes and around the food table. You could do a Dr Seuss baby shower table centerpiece based on “The Lorax” you can Save the Trees! Purchase small pots or votive candle holders in your basic color theme at the dollar store and plant small pine tree seedlings in them. These can be additional prizes awarded at the end of the party. Stars hanging from the ceiling can represent the Sneetches, you can also tape a star to the new Mom’s tummy for fun. Who said it? How well do you know your Dr. Seuss stories?This is a match game. Match the picture of the character to the description.You can download and print this game from an authorized Dr. Seuss website. Before the game starts, put 15 small items associated with babies on a tray and cover it with a baby blanket. These should be items such as a safety pin, bottle, pacifier, teething ring, baby powder etc. Give each guest a piece of paper and a pencil. Bring the covered tray into the room and place it where all the guests can see it, remove the blanket (that is also an item that was on the tray). No touching is allowed, leave the tray in that position for one minute and tell the guests to memorize the items that are on the tray, then cover the tray and remove it from site. Give the guests five minutes to write down what they remember was on the tray. The guest who gets the most items correct wins a prize. It is not a star, what is in that jar? Remove the labels from 10 jars of baby food. Label each jar and matching label with the numbers 1-10. Set the labels aside until the end of the game.Place the jars in a line on a table. Give each guest a piece of paper and a pencil. Each guest takes a turn looking at the jars of food and writing down their guesses on the paper 1-10.When all guests have had their turn, set the labels next to the matching jar. Announce each jar’s content. The guest with the most correct guesses wins a prize. How much did you say, you would be willing to pay? This game is played like the Price is Right. Display 10 baby related items. Make sure you have the EXACT price you paid (and a receipt if necessary) written on a piece of paper in your pocket.Point out one item at a time and tell the guests to write down their answer for each item as it is displayed. The guest with the most correct or closest answers wins a prize. We need your guess, will it be more or less? Fill a baby's bottle with jelly beans or other small candies; be sure to count them as you do. Ask each of your baby shower guests to take a guess at how many candies there are in the baby's bottle and write down their answer on a piece of paper. The guest whose guess is the nearest total of candies to the correct answer wins the bottle full of candy. Coordinate your food items with Dr. Seuss Books. 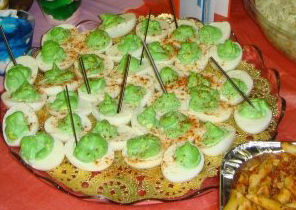 Display “Green Eggs and Ham” book next to tray. Peel cooled eggs and cut in half. Mix yolks, mayo, a little relish to taste and blue food color (the yellow yolk and blue=green). Put filling in a zip lock plastic bag and cut off the corner. Squeeze filling into the white egg halves. Serve next to a tray of ham. Display book “Fox in Socks” between the Cheese Tree and Poodle Noodles. Spear cheese with toothpicks and stick through Styrofoam. Place stuffed poodles next to the macaroni salad or mostaccioli tray. Decorate your frosted cupcakes by topping them with blue cotton candy. Make labels “THING 1” and “THING 2” and stick them to the cupcake papers. Blue or white icing looks great on these cupcakes. Stack red and white lifesavers in the center with a toothpick. A Dr Seuss baby shower is a fun, colorful and flamboyant way to celebrate a new baby and to show the mother-to-be love and support in a creative way. If you liked these Dr Seuss baby shower ideas, and want other ideas for baby shower themes, click here to go to our themes page. Dr Seuss baby shower theme! to knock off everyone's socks!